Hammock Isle at Bonita Bay is just off of the mangrove lined shores of Estero Bay. 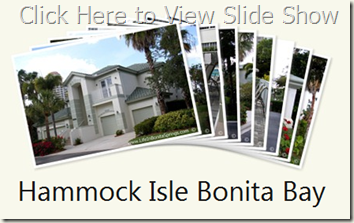 Hammock Isle is a petite complex of condominium homes nestled amongst mature oaks. Hammock Isle is merely five buildings with a total of fourteen condominium coach and carriage homes. Built in the year 2000, condo units at Hammock Isle range from 2,060 to 2,748 square foot of living area with a floor plan that offers either three bedrooms or three bedrooms plus a den. Individual units in Hammock Isle are located on either the ground floor or the second floor. Second Floor condominiums at Hammock Isle, on a case by case basis, have a private elevator or dedicated space to have an elevator installed. The condos at Hammock Isle have two car attached garages. Residents and owners of condos in Hammock Isle enjoy use of their own private swimming pool, spa and cabana on site. Hammock Isle is just around the corner and easily within walking distance of Estero Bay Park, nature paths, Estero Bay Pier and the butterfly garden. Bonita Bay is ordered by Spring Creek, Imperial River & Estero Bay w/direct access to the Gulf. Residents enjoy Bonita Bay's private beach pavilion, 12 miles of bicycle and walking paths, basketball, boating/canoeing/kayaking, and 3 waterfront parks. Bonita Bay Club is member owned & offers 5 golf courses, 18 Har-Tru tennis courts, a state of the art fitness center & Olympic pool and a clubhouse offering casual as well as fine dining. Bonita Bay also offers a full-service marina w/Gulf access via the Imperial River. To learn more about the amenities of Bonita Bay, read also Bonita Bay Golf and Country Club. Contact us today for a current list of Hammock Isle listings in Bonita Bay. Other communities similar to Hammock Isle at Bonita Bay includes: Green Briar at Bonita Bay, Waterford at Bonita Bay and Harbor Landing at Bonita Bay.